A fabled land of seemingly infinite ancient treasures, this journey through Egypt will help you to uncover the remarkable legacy of one of the world’s oldest civilisations. Cairo, a bustling metropolis and showcase of Egyptian history, is where you begin. You will be introduced not only to the Great Sphinx and Pyramids of Giza, but the ancient city of Memphis, the beautiful Mosque of Muhammad Ali and the winding alleyways of the Khan el-Khalili bazaar. You will then board the M/S Mayfair for a four-night cruise along the River Nile between the celebrated towns of Luxor and Aswan. You will call in at incredible archaeological sites like the Temples of Luxor and Karnak, plus the tombs of the Pharaohs in the Valley of the Kings and Queens. Price includes flights, full board and all excursions aboard the M/S Mayfair, and bed & breakfast at Steigenberger El Tahrir and Basma Hotel. Based on two people travelling. Your flight lands you in the vibrant capital of Cairo, where you will be met and taken to your luxury hotel in the bustling Luxor district. A full day privately guided tour will take you to discover what is one of the world’s greatest ancient attractions – the Great Pyramids of Giza. These magnificent structures represent the highest level of pyramid construction and rarely fail to capture the imagination. You’ll also enter the temple of the Sphinx whilst your Egyptologist reveals the histories and mysteries surrounding this legendary figure. Later you will drive to the ancient capital of Memphis to see the huge reclining statue of Ramesses II, before venturing onto the step pyramid of Saqqara, the Serapeum and the three tombs of ancient Egyptian nobles. You’ll delve deeper into the culture and history of Egypt on the following day with visits to the Citadel of Saladin, Egyptian Museum and beautiful alabaster mosque of Muhammad Ali. Finishing in the 13th century Khan el-Khalili bazaar with its twisting alleys, shops and stalls. Today you will leave Cairo for the riverside city of Luxor, from where you will embark on your Nile Cruise aboard the M/S Mayfair. The first stop on your elegant river cruiser are the mighty temples of Karnak and Luxor, after which you will rejoin the boat for dinner. The next day you’ll find yourself on the West Bank of the Nile where you can visit the astonishing Valley of the Kings and Queens with their underground tombs and hieroglyphics. 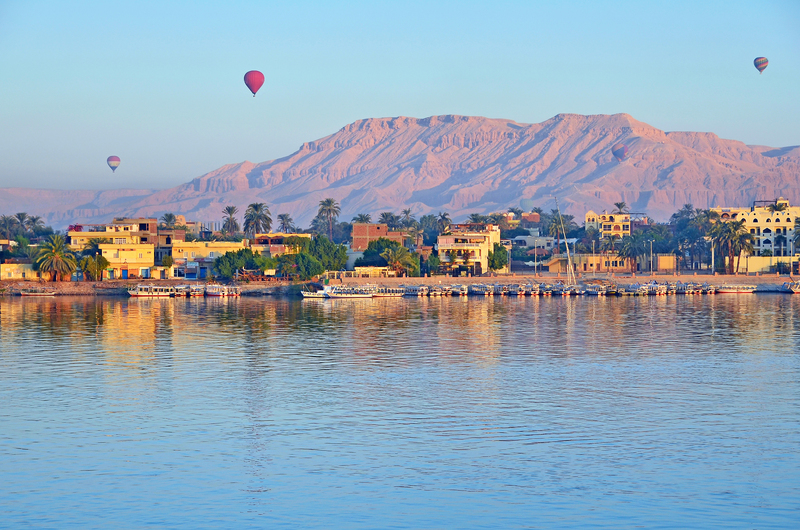 You’ll discover the Temple of Queen Hatshepsut at El-Deir, El-Bahari and the mighty Colossi Memnon, before sailing to the city of Edfu where you’ll moor overnight and enjoy the Captain’s welcome cocktail party. On day three you’ll explore the renowned Temple of Edfu before continuing your journey onwards to Kom Ombo where you’ll visit a temple dedicated to two gods; Sobek and Haeroris. You’ll then sail to Aswan where you’ll enjoy dinner on board and a Galabeya Party. On the final day of your cruise you’ll be guided around Aswan’s High Dam and have the opportunity to visit the Philae Temple and unfinished Obelisk. In the afternoon, you’ll cruise to Kitchener’s Island and discover its wonderful botanical gardens in a traditional sailing felucca. Return to the boat for dinner and a Nubian Folkloric show. After breakfast on board, you will alight from the M/S Mayfair and be transferred to your polished hotel just a stroll away from the banks of the Nile. You’ll find yourself in a great position from which to explore the city and its many attractions, from the Coptic Cathedral to the Nubian Museum. Alternatively, you can take the time to relax by the large heated pool. From Aswan, you will catch a flight back to London via Cairo.